Animal criminal activity appears to be on the rise. Wait — we don’t know that for sure, but there have been quite a few stories circulating lately about random creatures wreaking havoc on human-owned establishments. The latest is this bird that wrecked a liquor near Los Angeles. Multiple outlets have reported that a peacock damaged the California liquor store on Monday, but others are referring to the animal as a female peafowl, also known as a peahen. Either way, the avian suspect in question is large with bright plumage. More importantly, the wild bird destroyed $500 worth of champagne and wine while tussling with a police officer who showed up to capture the flighty intruder. 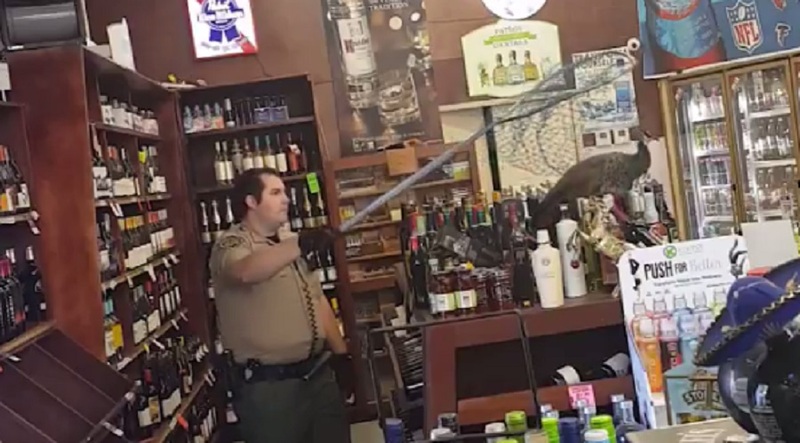 Store manager Rani Ghanem captured cell phone footage of the standoff between the officer and the rambunctious bird. Initially, Ghanem didn’t notice the bird in the store until a customer brought it to his attention. The bird managed to hang out for a full 90 minutes completely unbothered, perhaps because it was perched as still as a statue — that is, until the officer tried to remove it. Then, all hell broke loose. We kind of understand this bird’s reaction. Srsly, let’s not even talk about what we would do if someone tried to wrestle a bottle of wine from our grip. Eventually, the officer was able to contain the peahen and remove it from the store. The animal has since been released back into the wild, where it hopefully has learned to keep its claws off other people’s alcohol.